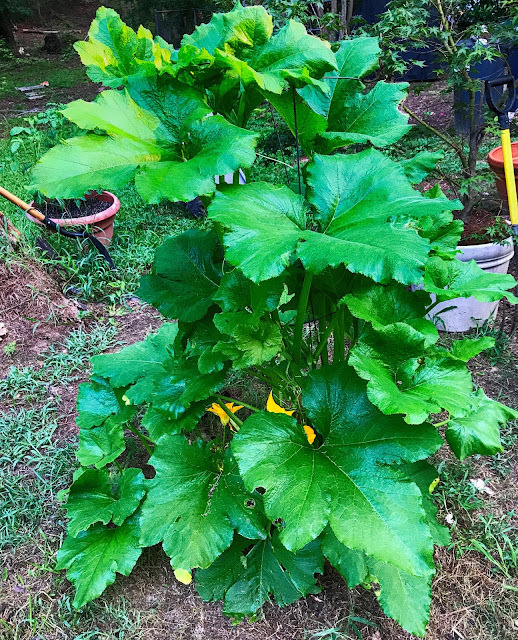 I know a few weeks ago when I posted a picture of my great nephew Jordan with this plant that volunteered to come up in our backyard that I said it was a watermelon. That post may have left you with the impression that it was, in fact, a watermelon growing in our backyard. But you would have been mistaken. The bigger the plant got, the more it looked like the squash plants in our garden plot. After Googling pictures of watermelon plants, this one looks nothing like them. I should have known that as I've grown watermelons in the past. I assumed that the plant was the result of Jordan and me eating watermelon on the backyard bench. Apparently, that was not the case. I put a tomato cage around this plant when it was small to keep the chickens from scratching it up. With all the recent rain, the squash had a growth spurt and it's now grown through the top hoops of the tomato cage. I do like volunteer mystery plants. It adds some excitement to my mundane existence. I would have thought it was a weed and pulled it long ago. I do not have a green thumb. Yep for sure you do not have a watermelon there. And probably a squash. I like squash from raw, fried or stewed. I'd eat it baked I am sure, just never had it. I still have the little grape tomato vine in Florida, confirmed on our last visit. BUT HEY! every body loves a mystery.. Be waiting to see, for sure! That's one healthy plant!! Are you sure it's not Jack's beanstalk? It will be interesting to see what develops. I recently had my first summer squash of the season and it was delicious. Hope you get some squash! Jordan will be happy waiting for the confirmation on what you have growing, laughing about it over a plate of squash on the table will be a great way to celebrate. Either way there will be something good to eat from this plant. I love the sensuous shape of the leaves. I love how vibrant those leaves! This waiting and wondering sounds not unlike parents who, at one time, didn't know whether they were having a boy or a girl.